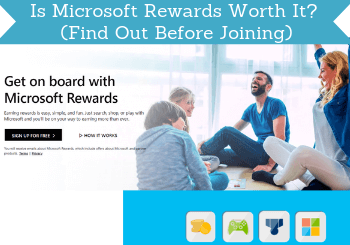 Microsoft Rewards claims to be a fun way to earn online. But is Microsoft Rewards worth it or is it a scam that is a waste of time? This is something you definitely need to know before joining as there are many reward sites online. If you do not join the legit ones with good options, you can end up wasting a lot of time. In this Microsoft Rewards review, I will share all the details about what you can really expect from this option so you can easily find out if it will be for you or not. What is Microsoft Rewards and what does it offer? Microsoft Rewards is owned by Microsoft which is a brand you probably know since it is a multinational technology company. It is free to join the platform. It actually used to be called Bing Rewards. So sometimes you might hear someone mentioning or writing about Bing Rewards. Sometimes you even see in the info by Microsoft itself that it is still called Bing Rewards at times. But it is the same platform and not two separate ones. It is just different whether people call it Bing Rewards or Microsoft Rewards – but the official name is now Microsoft Rewards. That it has Microsoft behind it means it has a legit and reputable company behind it which is a first great step when looking at potential reward sites to join. This does, however, not mean it will be worth it. It depends on several things. The main thing it depends on is how you can actually earn on Microsoft Rewards. So let’s start by going over the earning methods, how they work, and how good they are. We more or less all use the internet to do several searches every day. Maybe that was even how you found this article here on PaidFromSurveys.com. One of the ways you can earn through Microsoft Rewards is by searching online. So every time you do a search, you will earn a small reward. However, to get this reward, you need to have a Microsoft account, be logged into it, and use the search engine Bing.com. You can earn by searching online – but only if you use Bing. So it is only a relevant way to earn if you like using Bing to search. You get 5 points per search which are equivalent of $0.005. So you need to do a lot of searches to earn anything real. But it does not require any big effort. It is a way to earn by doing what most of us do several times every day anyway – IF you use Bing. Also, there are limits to how many searches you can do per day (more about this later in this review). If you shop online, there are several reward sites that offer cashback for the amount you spend. Microsoft Rewards also offers this. However, it is only on items bought in the Microsoft store. You can earn rewards by shopping in the Microsoft Store. Here you can rent movies, buy computers, software, games, and more. You get 1 point per dollar spent. So it is not a big cashback you get for spending so you should not use the shop to earn. But if you are using the Microsoft store anyway, it is nice to get a little money back. 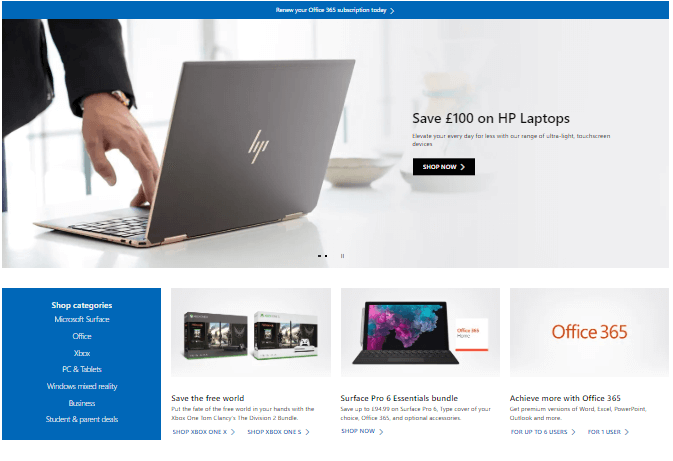 If you are interested in getting cash back in other stores than Microsoft, then you can check out the list of the best cashback websites – here you will find options for thousands of stores. Microsoft Rewards also offers a more active way to earn. This is an option where you can go to the reward page after you have signed up for the program, and here you can then sometimes find quizzes, daily offers, and more. The options change continuously and depend on your country. But overall you should not expect it to be a way to earn a lot. But if you like what else Microsoft Rewards has to offer, it can be a way to earn a little extra. 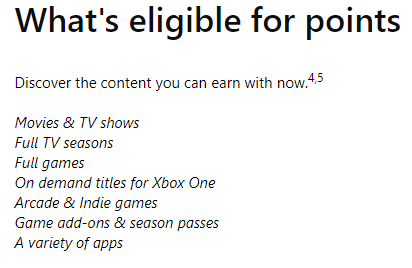 If you have an Xbox and regularly use it or spend money on content through it, it might be worth considering becoming a part of Microsoft Rewards as you can then get some discounts and cashback. For every dollar spent, you will earn bonus points. It is, however, only for eligible purchases. On the image above, you can see what is seen as an eligible purchase according to Microsoft Rewards itself at the time of writing this review. How much you will then get as a bonus depends on your membership level (more about these levels below). But you can earn between 1-20 points per dollar spent. So again not a huge amount but if you are using Xbox and spending money anyway, it can be nice to get this bonus. I have mentioned already that Microsoft Rewards has membership levels. You can be a level 1 or level 2 member. The way to move from level 1 to level 2 is by being active. If you reach 500 Microsoft Rewards points in a month, you will move to level 2. You will stay at level 2 as long as you earn 500 points every month. It does not matter how you earn the points. The advantage of moving to level 2 is that you will earn more for some of the earning methods and you can get up to 10% discount on rewards. For example, if you earn by using Xbox, you will earn 1 point per dollar spent as a level 1 member. As a level 2 member, you will earn 10 points per dollar. And if you are level 2 and have an active Xbox Live Gold, you will get 20 points per dollar. You can earn more as a level 2 member. Also, as a level 1 member, you can only earn by doing 10 searches per day. As a level 2 member, you can earn for up to 50 searches per day. So it can have some benefits to become a level 2 member. But to find out if that will even be worth it, you, of course, need to know how you can get paid. So let’s look into that now. It is very important to know the reward options for any online reward site before starting to spend time on it. What is important to know about Microsoft Rewards is that you can only use your points to buy products from the Microsoft Store. So your points will not as such have cash value, they cannot be exchanged for cash, and you cannot transfer the points to another person. But if you like the Microsoft Store it can be a great reward. But if you prefer earning cash rewards, you should instead check out the best PayPal survey and get-paid-to (GPT) sites. 1 point on Microsoft Rewards is worth around $0.001 and usually, you would then need around 5000 points to be able to find any reward (the equivalent of $5). At first, it can sound very tempting and as an easy way to use the options, Microsoft Rewards has to earn some extra cash online. But before finding out if it is for you, let’s look into how much you can actually earn. To understand the earning potential of Microsoft Rewards it is important to understand that it is not meant as a way to earn a lot of money online. You can see this from the earning methods and from the reward options. It seems to be a way to reward people that are using the products. You can figure out that the earning potential is not huge by, for example, looking at the search option. If you are a level 2 member, you can do up to 50 searches per day – this is the maximum you can get. That would give you $0.05 per day. If you do that every day for a month, you would earn $1.5. Most of the other earning methods are ways to get points by spending money. But even here there might be some limits when you look at the FAQ section carefully. There are limits on how much you can earn. Here it says that there, in general, are limits that might apply. It is difficult to find out exactly what this means. What I could find about this was that Microsoft says that they may limit the quantity of credits or reward per person or per household. This can change from time to time, so to find out the exact and current limits in addition to the ones I have mentioned above, you need to visit the Redemption Center. So in my opinion, you should not join Microsoft Rewards if you want to earn some extra money online. Then you should instead check out the best survey and GPT sites in your country. But if you are using Bing, the Microsoft Store, or Xbox, then it can be a way to get a little extra by doing what you are already doing. As you have to be logged into a Microsoft account to be able to earn, you can not just start using it on mobile. But it is possible to use on mobile. You just need to download the Bing app for this. 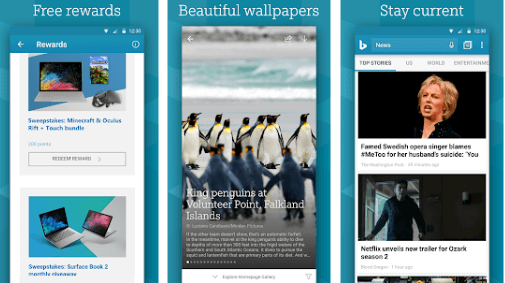 You can use the Bing app to earn on the go. So if you are using the platform and would like to earn a bit extra on the go, then the app gives you easy access to it which is great. Who can join Microsoft Rewards? Microsoft Rewards is not available in all countries. At the moment of writing this review, you can join if you live in the United States, the United Kingdom, France, Germany, Canada, Australia, New Zealand, Singapore, Republic of Ireland, Brazil, Italy, Netherlands, Norway, Spain, Sweden, Belgium, Hong Kong, Japan, Mexico, and Taiwan. Be aware that some of the earning methods might not be available in all countries. Being able to get support is something I find important on any online reward portal. On Microsoft Rewards, you can find a support center where you can submit a ticket. You should receive a reply within 24 hours which is a pretty good response time in my opinion. So it is clear that Microsoft Rewards is legit and not a scam. But this does not mean it will necessarily be worth it. To give you a better overview before deciding to join or not, let’s sum up the pros and cons. I think the main thing that decides whether Microsoft Rewards is for you or not is whether you are already using some of Microsoft services. If you are already using their store, Bing, or Xbox, then why not earn some bonus points even though the rewards are low. You will be earning by doing what you already do. 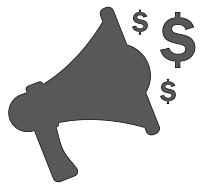 But if you, on the other hand, are not using any of these services and are looking for a way to earn some extra cash online, then there are many sites that are better. You can, for example, check out the best survey and GPT sites in your country here. These give you access to earn more, higher rewards, and most of them pay out in cash. So overall, whether Microsoft Rewards is worth it or not depends mostly on why you want to join. If you want to join to earn but is not using its services already, it is not really worth it, in my opinion. If you have any comments, questions, or have any experiences yourself with Microsoft Rewards, I would love to hear from you in a comment below. Microsoft Rewards is a legit way to earn a bit online. But it has limited earning potential and you cannot use your rewards for other things that Microsoft products. So if you use Bing, the Microsoft Store, or have an Xbox, it can be a good way to earn a bit by doing what you already do. If not, and if you mostly just want to earn some extra money online that you can also get out in cash, then there are many better options. I search with my browser (30 searches), and tablet (20 searches), and complete the three daily things plus any Email stuff they send each day. Ends up being about 9-10 bucks a month. I redeem them for Amazon gift cards. 5260 points for a $5.00 gift card. Great to hear Tom. Thanks for sharing your experience.